My city is full of surprises and I discover something almost every time I go out to sketch. Hidden behind the Chateau Ramezay Historic Site and Museum is the Governor’s Garden. Part kitchen garden, part orchard and part ornamental plants — this perfect little oasis next to Old Montreal’s most crowded square even has benches which I am fairly certain are there for sketchers. I was going to draw the garden itself but the shadows were so perfect on the gables of the houses on the perimeter that I started with those. Yes, i really like those nice crisp gables too Shari, creating a fun bouncing rhythm up the hill. 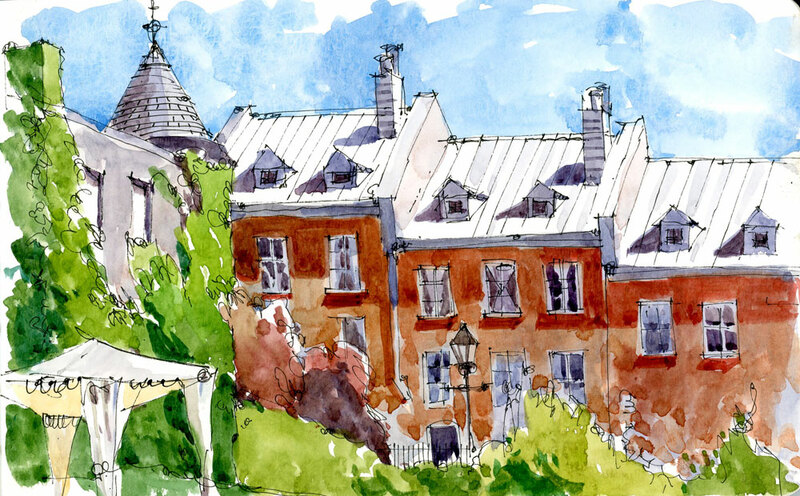 There must be so many quaint treasures to sketch in Old Montreal!